William Robley, the son of Thomas Robley and Isabella Mossop, was born at Marlborough Farm situated between the village of St. Bees and the market town of Egremont in West Cumberland. He was christened at the Priory Church, St. Bees, on the 22nd. October 1826. In his youth he assisted his father at both the Marlborough and Howbank Farms. No doubt the rigours of work on the farm helped to develop the physique that was to stand him in good stead in later years. As a young man he took up Wrestling in the Cumberland and Westmoreland style and eventually became a champion. A contemporary description of William says that he was 5 feet 11/2 inches tall, ‘ the stiffest man that ever peeled off in the Carlisle ring. His arm was as thick as another mans thigh and his back as broad as a bullock’s and quite as difficult to hold’. Possibly a bit of an exaggeration but the description goes on, ‘he was compactly built from top to toe and presented a picture of muscular development and manly strength rarely, if ever equaled. He was also one of the best looking men ever to appear in the ring and weighed in at about 13 stone. In the ring he was a most finished wrestler, delivering his men very clean’. His most successful year seems to have been 1852, when at the age of 25, he won many belts and championships around the North of England including Carlisle, Newcastle and Liverpool. The elite predicted that he would eventually reach the highest pinnacle of wrestling, which he did! He started his career very early, winning minor bouts, but it was in Broughton in 1844 at the age of 17 that he beat Isaac Woodend, an established wrestler. From then on he was well known and wrestling regularly. In 1851 he won at the Scafell Hotel, Marport and Wigton. In 1852 he won at Maryport, Wigton, Carlisle, Newcastle, Hexham, Liverpool, Gilsland and Weardale until, at Whitehaven he was awarded the Championship belt by Mr. Joseph Fearon. 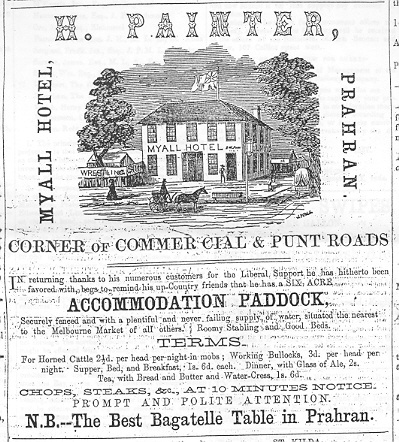 Although prize money was small in those days, an advert in the ‘Cumberland Paquet’ of the 31st. of May 1853 advised that, ‘William Robley of Egremont, the Winner of the Heavyweight Prize in Liverpool, can be backed to wrestle any 16 stone man in the world from 200 to 500 pounds a side in the Cumberland and Westmoreland style. The best of five falls to come off within 2 months’. Clearly there was money to be made on the side. On the 29th of July 1853 it was reported in ‘The Carlisle Journal,” The lovers of wrestling will learn with regret that William Robley has been induced by the solicitations of his friends to retire from the ring which will consequently lose one of it’s brightest ornaments’. However, it may well be that the ‘solicitations’ were more than friendly! William’s love for the ladies and his general wildness were well known to his family and their reluctance to indulge him is reflected in the wills of both his father, Thomas, and his uncle, John Robley. In the will of the former, it starts with the statement that William has already been given several sums of money ‘to settle and advance him in the world’ . So in 1854 his family assisted him to migrate to Australia, where he continued his wrestling career, beating Charles Bryan, a Penrith man, and Ben Pennington of Low Wood. Returning to England the following year, he then spent three years in North America before once again returning to Australia. When William Robley arrived in Melbourne for the second time in 1859, the 'gold rush' was in full swing. From 1851 diggers had spread in all directions over the countryside, pushing far into the bush in the hope of new finds. There were no tracks and the first comers had to cut their way through the bush using tomahawks or a fire stick to clear the way. There were no supplies to be found and the local mining warden warned diggers not to cross the ranges without at least having two weeks food with them. In 1858, the year before William's arrival for the second time, a party of Englishmen, mainly Cumbrians, succeeded in crossing the dividing ranges and, eleven miles from the present site of Marysville, found Gold in a creek which they named after their native Cumberland. The word spread quickly and may well have been this news that attracted William to return to Australia. A whole new community sprang up along the' Yarra' track providing stores and pack horses for transport for the diggers deep in the bush. As well as the finds along the Yarra tracks, a rich seam of quartz was discovered at the head of the Goulburn in 1861. To mine this effectively, machinery had to be brought from Melbourne. All this had to be stripped down to small pieces weighing about 200 pounds each so that they could be carried by pack horses. As Woods point grew so did the numbers using the track and it became obvious that a better route had to be found and a proper road constructed. Consequently the Government offered a reward of one hundred pounds for the best route. 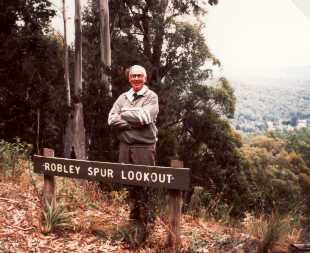 William Robley won the prize and his name was given to Robley Spur, to the East of Marysville. He worked on the South Yarra Trust Road to the Jordan Gold diggings, 160 miles in length and from Wood’s Point to Melbourne, the track that he scouted was 40 miles shorter. Parliament allocated 30,000 pounds for the road and in 1863 construction began. The road was only cleared of timber and natural grades were retained, as a result there were many S bends! Once more he returned to Australia and the West Coast diggings in New Zealand where he stayed for a year or two. He much admired the Maoris whom he termed the finest race of men that ever met his eyes and whose build made him appear ‘as a child’! Returning to England he spent quiet 2 years in Egremont and for a short while took a job as a River (Beck) Watcher or Bailiff. He then sailed to Canada where he spent 12 years living in the backwoods, roving and hunting with his two dogs. William was a skilled taxidermist as well as a hunter and throughout his travels many heads and skins of animals were collected and stored with his brother John Robley in Beckermet. It was said that at fishing and shooting in Canada he could beat the natives at their own game. However for the last year or two before he returned to England he suffered from a stomach complaint (probably cancer) and it is probably this that eventually caused his death. Just prior to his leaving Canada for England he had some dealings with the Canadian Department of Lands regarding a free grant of land on Rock Island on Horn Lake. This fell through when he was told that the land was not free but would cost him 5 pounds per acre for the 194 acres requested. At that time he was short of money and in fact had to ask his brother, John, for money to purchase his passage home to England. In letters to his brother he writes that he is feeling a little better despite the fact that Dr. Campbell’s medicine is no longer working. He says he may have to go to hospital in England or Toronto but that he does not want the stomach pump! He would rather die first! If John could lend him 10 pounds he would return to England. His own money was all gone having made an injudicious loan to a friend. He thanks John for the offer of accommodation but feels that John’s new house, (Yourity) may be too grand for him. In his last letter from the ship he admits to being most unwell but feels that once he gets home and has a bit of trout fishing all will be well. He sailed home on the ‘City of Chester’ but on reaching his brother John’s house in Beckermet, took to his bed and died about a week later on the 22nd. May 1889 aged 62 years. He is buried at Egremont. The background to William Robley’s life has largely been gathered from contemporary Newspaper articles and information on his wrestling career written by Audrey (Steele) Sykes from original research by Margaret Russell. He has historical significance as an early pioneer in the opening up of the Australian hinterland in the State (then the Colony ) of Victoria. There is a reference to this exploration in the book 'Healsville' A History of the Hills, by Sally Symonds . The first day's sports, under the direction .of the Australian Wrestling Society, took place on Monday, at the Myall Hotel, Prahran. The society has only recently been formed, and we believe this is the first meeting of the lovers of this sport which has been held in the colony. The attendance was very numerous, and a great number of competitors appeared on tho ground. It was resolved by the stewards to extend the amusements till the following day also The stewards offered eight prizes to the best wrestlers in the Cumberland and Westmoreland, and also in the Cornwall and Devonshire styles. In the Final Fall. W. Robley threw M. Johnston. The first day's sports were then brought to an end. Every one seemed highly delighted, and the play on all sides was pronounced to be excellent. The wrestlers wore no shoes, and, all was conducted in a very orderly and satisfactory manner, Not a single accident occurred throughout the day. Prior to the commencement of the wrestling a foot race was run for a silver watch. The attendance of visitors on Tuesday, though not so numerous as on tho first day, was still large there being about 500 persons on the ground. The wrestling today was in the Cornwall and Devonshire styles. W Robley, who carried off tho first prize on Monday, was backed freely by his friends, but was thrown by Kernick, whose play was much admired, although he came in for two "downers" at the hands of Birmingham and Ball. First prize, £8, W. Robley. , Second do, £4, M Johnston. , Third do, £2, T. Clarke Fourth do, £1, W. Pigram. It is proposed to hold another meeting in the course of a few weeks, of which due notice will be given. The subscription of 2s. Od. constitutes a person a member of the society. A great many gentlemen have put their names down for a liberal subscription, and if the events that have characterised the advent of the society can, be regarded as any guide, the promoters may regard its successful establishment as a fait accompli. Added by John Robley. January 2014. At this place of resort there was a large gathering of the lovers of athletic sports, not less than seven or eight hundred persons of both sexes, attending to witness the trial of skill among the wrestlers for the honor of being included in the select few entitled to compete for the five prizes in the Cumberland and Westmoreland, and the Cornish and Devonshire styles respectively. The final competition is to be for a challenge cup and prizes rated at £8; £4, £2, and £1 in each style, and naturally creates some excitement in the wrestling world. The athletes mustered in large numbers and it was easy to note the reappearance of the old familiar faces, who have year after year entered into the competition. The wrestling, entitled Cumberland and Westmoreland, does not differ materially from that practised in the dales of the Tyne and Wear, consequently there were quite as many competitors from the latter localities as there were from Newcastle, Canonby, Kendal, and Carlisle. A large square area was roped off directly in front of the grand stand, and its surface well strewed both with bark and saw dust to lessen the force of falls. The spectators speedily surrounded this enclosure, and a few betook themselves to the stand, whence some thought the best view was to be obtained. Everything being ready, at a few minutes before three o'clock p.m. there entered the ring Mr Andrew Robinson, scorer, Messrs Wholah and Donaldson, umpires, and Mr Thomas Irving, referee. The officers first proceeded with trials for the standards to compete in the Cumberland and Westmoreland style. William Robley, William Robson, John Vipond, John Milburn, Robert Hope and Beadle. Tbe election had proceeded thus far (leaving six more to be chosen on Saturday) for wrestling in the Cumberland and Westmoreland style. When near upon six o'clock, the officers proceeded to make a start for standards in the Cornish and Devonshire style. Our reporter was informed on leaving the ground, that the election would not be completed by dark, though it was probable the whole of the preliminary business would be got through by Saturday night, and the final competition come off in the ensuing week. There was some splendid exercise during the afternoon, the most remarkable feats taking place between Milburn and Tyson, Dixon and Beadle. The first of these contests was exceedingly protracted, several pairs deciding their claims before any decision was arrived at between the men specially mentioned. At one time Tyson lost hold of Milburn's waist, when the latter had still full grip of Tyson's neck. Milburn claimed the throw, but ultimately consented to give his antagonist a further chance, and, after another exciting struggle, threw his man amidst loud cheers. When Robley, a stout-built fellow, apparently as wide and as strong as a horse, and with a jolly laughing countenance, came within the ropes, nobody seemed very willing to tackle him. He threw in succession Michael Gannon and Wm. Beadle, not, however, without the latter giving him some trouble to get him off his legs. When Beadle's lithe body was fairly in the air, he went to the ground with a ring, and Robley walked off triumphant. Betting was pretty free among the knowing ones, and if one might mention such a thing, there was a shade of dissatisfaction that old victors like Milburn and Robley should be there to diminish the chances of less redoubtable men. There was, however, the most generous appreciation of the prowess of these stalwart fellows, and no stint of applause. We expect a real treat when the final competition comes off. The challenge cups are valued at £15 each, and money prizes to the extent of £60 will be contested for, open to all comers. The athletic sports at thc Copenhagen Grounds commenced on Boxing Day, were continued over Saturday, and the prizes assigned, so far as regards the competitors in the Cumberland and Westmoreland styles. The forty standards for the Cornish and Devonshire style were likewise made up, and the first round commenced. The proceedings excited much interest during thc day, and we shall be surprised if Mr Cherry, the liberal donor of the prizes, has not more visitors during this day (Monday) than upon either of the previous days, over which the contest has lasted. Through some inadvertency sufficient publicity was not given to the holding of these sports, and the result has been an attendance very much below deserts, and certainly not as fully remunerative to Mr Cherry as he had a right to expect. The entries, it seems, were not so numerous as was anticipated, and though thc arena was graced by the very best athletes of the district, their very presence seems to have deterred good but second rate wrestlers from putting in an appearance. Perhaps on subsequent occasions it might be as well to offer separate prizes for eleven stone men and under, and for heavy weights; as at present "all comers" stand little chance of being evenly matched. Contrary to expectation the first prize went away from both of the men, one or the other of whom most people made sure would get it; but of this more hereafter. The prizes, as originally announced, were the cup and £15, £8, £1, end 10l; but as the entries for the Cumberland and Westmoreland wrestling were not sufficiently numerous, thc competitors appointed a committee, and with Mr Cherry's concurrence, reduced the entire sum, but distributed thc residue among a larger number of persons, for it was deemed better that where skill was so evenly distributed, to be credit of a prize, however small, should not be withheld. It is understood that the cup is to be held for 12 months, unless within that time thc victor has it wrested from him. If within that period the holder be challenged, the challenger is compelled to give the challenged one month's notice, aud to deposit with thc donor the sum of £10 as a guarantee of good faith. Meanwhile, the donor retains possession of the cup, but if, at the end of twelve months, the victor remains undisputed, he can demand the trophy at the hands of the donor as his bona fide property. As we have intimated, the proceedings of the day opened with the preliminary trials for the appointment of the Cornish standards, and this business was not concluded till three o'clock p.m. having lasted for fire hours as nearly as may be. The Cumberland and Westmoreland, now fell to work to reduce the numbers they stood at the previous day. William Robley - John Milburn was to have been Robley's antagonist, but he did not put in an appearance. The "final fall" was two out of three. The two men, it seems, came to the ground on their knees nearly together that some doubt exists as to which if either, can claim the victory. Robson claimed to have brought his antagonist to earth before he himself reached it, and met with some supporters in his view. Robley declined to test the matter in another round, and walked off. Some intercession was then attempted, and five minutes allowed for Robley's reappearance. The athletes again stood side by side, when Robley objected to Mr Wood standing "as umpire", whereupon Robson objected to Mr Irwin as referee. Robley ultimately declined to wrestle any more, left the ground, and the result was that the cup (with £15) was awarded to Robson. William Robley came in of course for the second prize, John Vipond for thc third, of 1pound and Matthew Potts for the fourth, of 10l. Paul Tyson, Isaac Gardiner, William Beadle Thomas Ritson, Michael Gannon, John Milburn, Thomas Blackett, and three others got 10l. 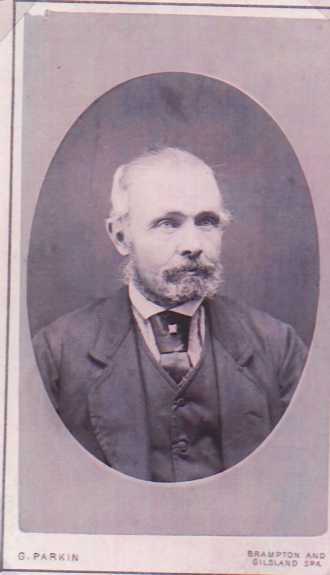 Robley, we believe, is a native of Egremont, near Whitehaven, and one of the pioneers of the Jordan gold field. John Milburn, belongs to Weardale, Hope hails from Canony, Beadle from Weardale, and Gannon from Ireland. We learn that Mr Robson is not to remain in undisputed possession of the trophy for any great length of time, as Mr Robley being dissatisfied with the decision of the referees as to the "fall" intends within a month challenging the present holder through the columns cf Be With Life - first placing in the editor or the donor's possession, the guarantee of ten pounds. Should this contest come off, as there is little doubt it will, a most exciting affair may be anticipated. William Robley must have presented a most intimidating appearance while all these negotiations were taking place. " The laughing countenance" of the previous day must have been wiped from his face and if his size and stature intimidated his opponants, one wonders what the effect may have been on the judges?